This is Silver. 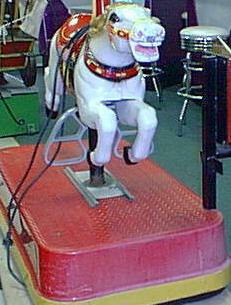 This is a Kiddie Ride that we restored a couple of years ago. Again, a very unique ride. This is much like our other horse rides but this one comes with a red base. What a neat toy for any kid! If you wish to obtain information on this ride, please send an email or give us a call at 304-724-2100.